As the one-year anniversary of the tragic Parkland, Florida, school shooting approaches, Democrats and gun control activists are making a concerted effort to pass strict new gun laws. On Feb. 14, 2018, Nikolas Cruz allegedly opened fire at his former school, Marjory Stoneman Douglas High School in Parkland, killing 17 students and school staff members, and injuring 17 others. The shocking carnage and innocent loss of life marked the deadliest school shooting in the nation’s history. Much of the ensuing outrage was aimed at the National Rifle Association and lawmakers’ unwillingness to back unpopular gun control measures—but the latter part appears to have changed. A legislative analysis shows that almost two dozen gun control bills have been filed in either the House or Senate since the 116th Congress began Jan. 3. It’s the largest collective effort since the Sandy Hook school shooting in 2012. Among the newly proposed legislative items is the “Gun Manufacturers Accountability Act,” which would strip civil protections from firearm and ammunition makers, and sellers if someone was harmed from one of their products. Another bill is Sen. Diane Feinstein’s so-called “Assault Weapons Ban of 2019,” a retread of the California Democrat’s past efforts to ban semi-automatic long guns. But perhaps the most promising bill is the “Bipartisan Background Checks Act of 2019,” also known as H.R. 8. The measure would require “universal” background checks for the sale of all firearms. The hearing was an opening salvo for the slew of bills already introduced. Notably, the Democratic-controlled committee blocked House Minority Whip Steve Scalise (R-La.) from speaking in favor of victims—and gun rights. Scalise is himself a survivor of gun violence, having been critically injured during a politically motivated mass shooting in Alexandria, Virginia, on June 14, 2017. Scalise was shot when shooter James Hodgkinson opened fire on a group of Republican lawmakers and volunteers during a baseball practice. But following their recent midterm election successes, Democrats are enthusiastic about their chances of securing legislative victories, in spite of Republican control of the Senate. Heading into last year’s elections, many Democrats—particularly in suburban areas—not only campaigned on gun control, but those in battleground House districts closed the final days of their campaigns vowing to take action. Newly elected Rep. Sean Casten (D-Ill.) defeated six-term incumbent congressman Peter Roskam, a Republican, in a contest to represent an affluent district west of Chicago. Health care reform and strict guns laws were Casten’s winning platform. “The impact of the school violence is cumulative, and those cumulative stories are influencing the debate significantly,” Roskam said in an interview with McClatchy News. Similarly, Democrat Lizzie Fletcher defeated incumbent Republican John Culberson in Texas’ 7th Congressional District, and Democrat Jason Crow unseated incumbent Republican Mike Coffman in Colorado’s 6th Congressional District, despite both Republicans being endorsed by the NRA. Democrat gun control advocate Lucy McBath also defeated NRA-endorsed Republican incumbent Karen Handel of Georgia, thus taking over conservative icon Newt Gingrich’s former district. A number of states are pushing gun control measures in what looks to be a two-pronged state and federal legislative strategy. A significant development from the 2018 elections is the newly acquired full Democratic control of governorships and legislatures in New Mexico, New York, Maine, Nevada, and Colorado, and lawmakers don’t seem to be wasting any time advancing new limitations. According to the NRA, anti-gun activists and legislators are meeting privately Feb. 12 to discuss firearm restrictions in Nevada, while a Michael Bloomberg-backed bill to ban all private firearm sales among law-abiding citizens is advancing in New Mexico. Bloomberg, the billionaire ex-mayor of New York City, bankrolls the anti-gun group Everytown for Gun Safety. In Washington state, a November ballot initiative raised the minimum age to buy a semi-automatic firearm to 21 from 18, and further requires expanded background checks and strict gun storage requirements, among other items. 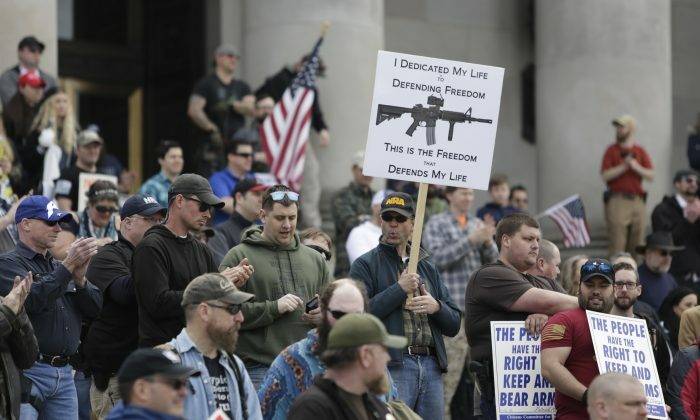 But on Feb, 11, nearly a dozen Washington sheriffs said they won’t enforce the new restrictions because they believe it violates the Second Amendment. Some parents and students tied to the Marjory Stoneman Douglas High School shooting may feel the same way. Kyle Kashuv, a student who survived the Parkland shooting, has been marginalized by the media for his stance on gun rights. During a one-hour interview on the “The Rubin Report,” Kashuv recounted his harrowing experience and explained why he supports the Second Amendment and opposes the gun control activism of his classmates. Andrew Pollack, the father of slain 17-year-old student Meadow Pollack, has been a leading advocate of accountability, rather than gun control. Former Gov. Rick Scott, now a Republican U.S. senator from Florida, invited Pollack to be his guest at President Donald Trump’s Feb. 4 State of the Union address in Washington. A 458-page commission report issued on Jan. 1 outlined numerous failures by the Broward County Sheriff’s office and the Broward public school system in the leadup to the fatal school shooting. The report cited alleged shooter Cruz’s documented history of problems and failed institutional responses. Prior to the Valentine’s Day 2018 massacre, there were 69 incidents on record in which Cruz engaged in concerning behavior, talked about guns, threatened someone, or committed violence. The Broward Sheriff’s Office also received at least 18 calls warning about Cruz from 2008 to 2017, including that he “planned to shoot up the school.” But somehow, Cruz went unchecked. Broward County Sheriff Scott Israel was suspended last month by newly inaugurated Florida Gov. Ron DeSantis over Israel’s handling of the mass shooting. “Sheriff Israel has repeatedly failed and has demonstrated a pattern of poor leadership,” DeSantis said in a statement. But for Pollack, the best way to prevent another Parkland is to be prepared—and that’s getting lost amid politics as usual.